Beautiful, crisp white 100% cotton panels with ballerina appliques. 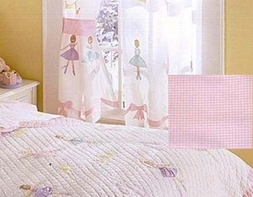 Features a pink & white gingham top border with 10" ties, which allows adjusting the drapes another 8" in length. Also includes two pink & white gingham check tiebacks. The panels are not sheers, but are unlined cotton so they let through some sunlight. Covers a window 84 x 84 inches in dimension.